Happy New Year! Ok I’m a little late with this one but it’s been lovely to have the time off. As always this time of year, there’s a lot of talk of resolutions. New Year, new me and all that. More power to you if you can do that gym/healthy eating/early morning run every day/no alcohol/no chocolate/shopping ban thing. I have a lot of admiration for you guys! But I am that person who falls off the wagon immediately. That person who eats a doughnut while writing down my resolutions. So while I am trying to be more active/healthy etc., I’m not going to beat myself up for eating pizza. Life’s too short! Anyway, I wanted to catch you up on the last couple of weeks. As always with the Christmas period, there’s a lot of dinners, drinks, nights out and catching up with friends and family, which I love. It’s the main reason why Christmas is one of my favourite times of the year. I was a lucky girl and got a few things that I’ve been coveting. This Bagatiba necklace is one that I’ve had my eye on for a while. If you haven’t heard of Bagatiba, you need to check them out! Gorgeous pieces of jewellery, I will definitely be adding to my collection over the next while. My sister also bought these amazing silver boots for me from Zara. They are so comfortable and ideal for me and my “all black everything” attitude. As always for Christmas, the best part is giving presents to your loved ones. My favourite reaction was when my little 13 year old sister realised that myself and my other sister are bringing her to London this July. There were tears! I literally can’t wait to see her face when I give her birthday present to her next week! Did anyone brave the sales? I am not a good shopper when it comes to the sales. The crowds, the madness, the ancient seasons rolled out again, I can find it a bit of a headache, as much as I do love a bargain. The best thing I did was go onto the Zara app (can you tell I’m a massive Zara fan?!) on the 26th and order my sale items from there, while I was all cosy in my bed. Ideal! Below I’m having a little wander in Celine, eyeing up my next potential purchase. I’m so obsessed with their bags. There’s at least three Celine bags that I want right now! How incredible does St. Stephen’s Green shopping centre look in the below picture? I find it very satisfying as a person obsessed with symmetry. 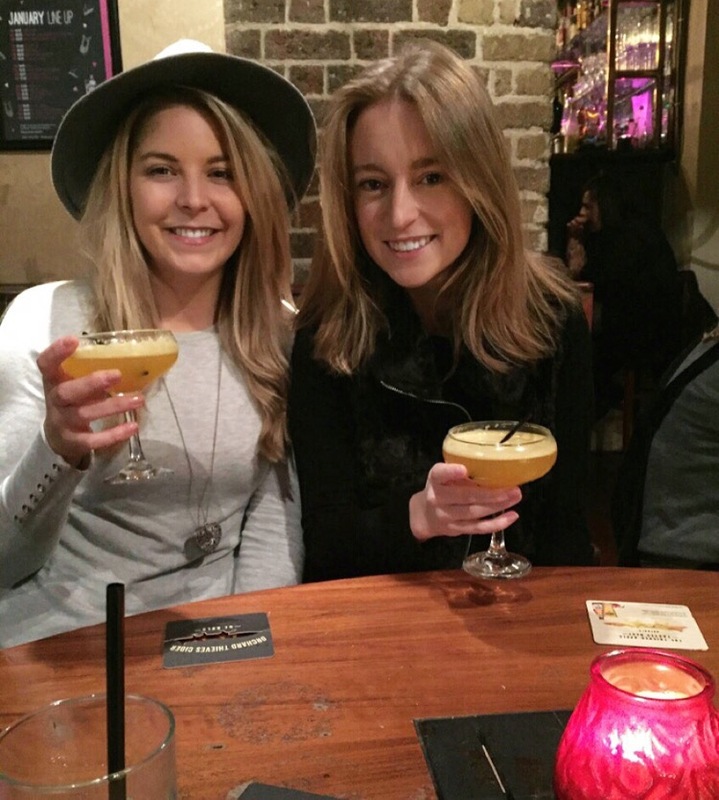 I’ve been making more of an effort to go to different bars and restaurants in Dublin. In the last few years, there’s been a massive increase in the number of amazing places to eat and drink in Dublin. For such a small city, we really are pretty spoilt for choice. This particular night, myself and my friend Jenny decided we were going to try a few places we hadn’t been to before. This was one of my favourites. Peruke and Periwig is a great little spot and really reminds me of The Dead Rabbit, a speakeasy in New York. If you’re in Dublin, definitely check it out. Also, look how excited I am waiting for my cocktail… it’s the little things! One of the most fun days/nights that I had over Christmas, was the marathon catch up I had with the friends I made when I lived in France. Back in college, I did an exchange in Rennes, Brittany for a year. During that year I made amazing friendships and I am very lucky that lots of those friendships were with Irish people that I could see often. It’s always a bit of a wild night when we get together, but definitely worth the pounding head, dry mouth, spinning sensation the following day. And maybe the day after that too. The only problem was that we met up on the 30th, the day before New Years Eve. Safe to say I wasn’t feeling too fresh ringing in the new year! As a result, I was happy to lay low for New Years Eve, and by laying low I mean a house party. These over the knee boots are probably (definitely) overkill for a house party, but they hadn’t had an outing yet. It’s difficult to see thanks to the crappy lighting, but these are actually my oxblood coloured boots that I bought a while back. A simple black skirt and top hopefully saved the outfit from being too much. On Saturday, I wore this new skirt that I got in the Zara sale, obviously. This post is making me realise that I have a serious Zara problem and need to branch out. Anyway, I love the 70’s vibes from it and as a big fan of suede it’s right up my alley. My friend and I went for brunch in Farmer Brown’s. 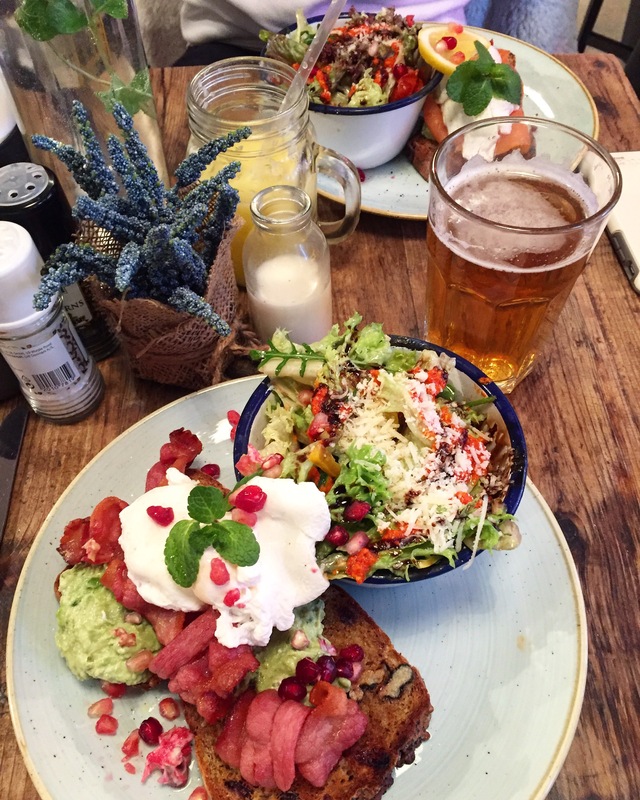 Poached eggs, avocado, rye bread, bacon, salad and sweet potato fries was the perfect fuel for a look around the shops. Avoiding the sales stress of course. One of my wishes for 2016, is that I make more time for my blog. I’m pretty proud of this little thing and find it incredible how many of you follow me and read my ramblings. I will try to be more consistent with my posts, hopefully improving all the time and challenging myself. Here’s to a lovely year with Okaybee!